June 28, 2016 - Happy Tax, the innovative franchisor offering a better way to file tax returns for both consumers and tax business owners, is wishing Henry Bloch, the creator of the national tax preparation industry, a very happy 94th birthday on July 30th. Mr. Bloch is a true entrepreneur, an innovator and a generous philanthropist. 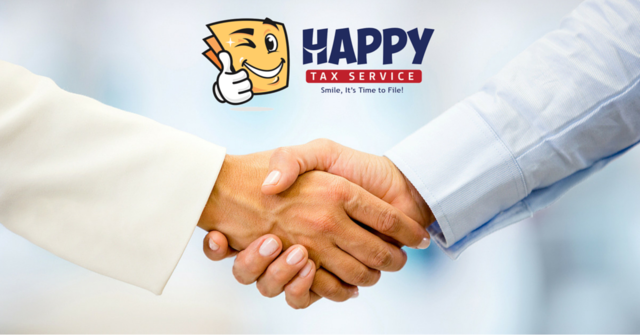 Happy Tax has multiple franchise offerings in the tax return preparation industry, which serves over 125 paying million customers per year. Currently, the company is launching its new Get Out of College Debt program as a way of offering exciting opportunities to the next generation of entrepreneurs. The Happy Tax model is a great choice for college students and recent graduates who wish to own a business and generate income to pay off their student loans. Since all Happy Tax returns are prepared by CPAs that work for the company, the franchisees get to spend their time working on sales, marketing and business development, which is a perfect fit for college students or anyone that enjoys helping and talking to people. The company's offerings include both a low-cost, home-based franchise that doesn't require risky leases or costly employees, as well as an area representative opportunity that enables entrepreneurs to sell franchises and coach franchisees in a specific geographic area that they own. Just as Mr. Bloch innovated back in 1954 when he started preparing tax returns at the predecessor to H&R Block named United Business Services, Happy Tax is on a mission to provide today's busy consumers with a more convenient way to file. There is a tidal wave of change overtaking the tax industry, in a time when inventive new companies like Uber, AirBnB and WeWork have shaken up other stale markets. Built upon efficiency, the Happy Tax system allows everyone to do what they do best, working around proven strategies popularized in bestselling books "The E-Myth Revisited" by Michael Gerber and "The 4-Hour Workweek" by Tim Ferris. In addition to enabling existing college students to start their own businesses, the program will also waive the initial franchise fee for one recent graduate (per school) as selected by the company. In order to qualify for the franchise fee waiver, the student must have graduated from a college, university or trade school within the past 12 months. "Henry Bloch has helped thousands of entrepreneurs to get into the tax business and he has also been a benefactor to business schools that teach entrepreneurship," said Happy Tax founder and CEO Mario Costanz. "Our business, as well as this new program, looks to follow in his footsteps and assist others to create wealth for themselves, starting by leaving college without student loans." Franchisees earn between $140 and $400 for each tax return they or their team members source. They can also earn income year-round by offering accounting and bookkeeping services. Happy Tax is well on its way toward reaching its goal of adding 250 new franchisees for 2016 along with 25 area representatives across the country. Happy Tax's on-demand, concierge model was born out of consumer frustration with unreliable, under-qualified tax preparers with no licensing or certification and as little as five days of tax training. The virtual tax office designed by Happy Tax bridges the gap between the high-quality, pampered and convenient customer service that consumers want, and accurate, reliable and professional tax returns prepared by CPAs with a minimum of 5 years of training and experience. Happy Tax offers franchises to those wanting to earn additional income and build their own business. Utilizing its patent-pending technology and processes, Happy Tax franchisees are able to operate with low overhead and increased flexibility.